The Platinum machine now there is a machine to be proud of! 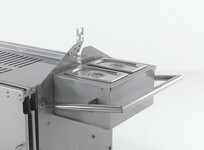 Any hog roaster would love to experience the art of cooking on our machines and they can! The Platinum is like a top class car stylish reliable with fantastic performance it screeches quality and one that will never let you down. 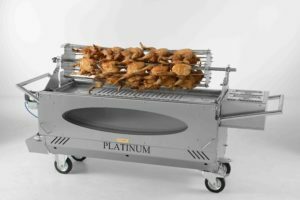 Used for many years by professional caterers The Platinum leads the way where others fall behind our machines are sold all across the world. 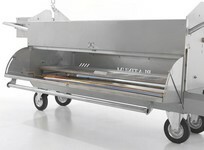 The Machine has lots of appeal and the first thing you could say is the size the machine is large enabling you to cook a lot of food so ideal for catering for large parties and also comes with attachments so you can cook even more! 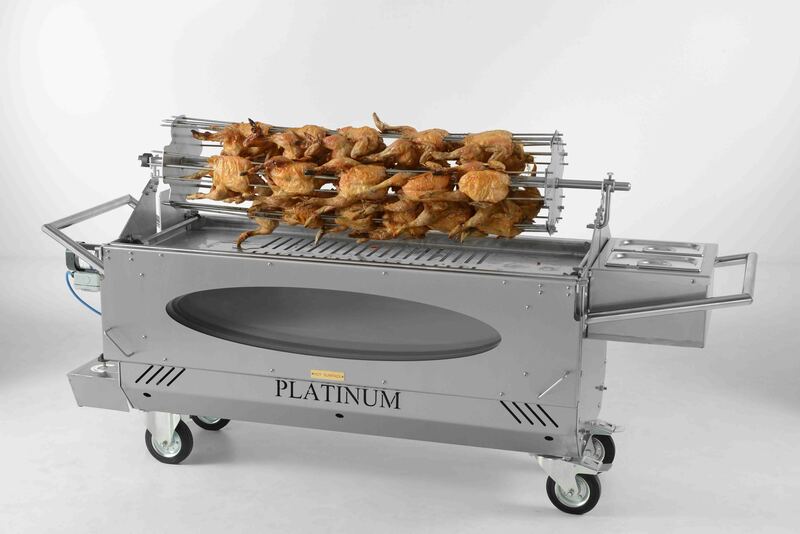 The Platinum now has a barbeque plate, which is a simple yet a really effective plate that slots onto the machine and there you have a very sophisticated hot plate that is controlled by duel fuel so you can cook to perfection every single time. You also have two cooking areas with The Platinum one on the top that can house the pig and one on the underneath that has a huge reinforced glass window that lets you watch the food cook but is also a closed off section an ideal oven and useful for lots of things such as jacket potatoes and you can fit a lot of jacket potatoes on this machine, sitting on the side of the machine is two huge stainless steel containers these generate heat and keep the food nice and warm and can be used for a variety of things such as soup, jacket potato fillings and gravy they can also be removed for cleaning. 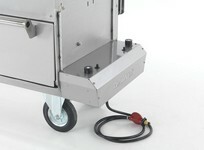 The Platinum has a large robust handle this handle ensures the machine moves with ease and to top it off the machine has a fantastic set of wheels! 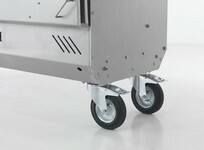 Strong and sturdy and ensuring you can move the machine over the most uneven surface. Thinking of investing in a machine then look no further than The Platinum a machine that performs time and time again a machine you will enjoy cooking on!